The directions to and through this route are straight forward. From Marietta Ohio, take state route 26 east all the way to the route's end in Woodsfield. 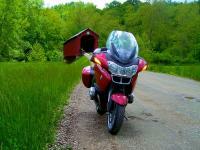 This route shows you a few of the state of Ohio's 2,000 covered bridges. The route is one of the country's prestigious official National Forest Scenic Byways. This is a great hilly section of southeastern Ohio near the West Virginia border. The entire route travels through the Wayne National Forest and follows the path of the Muskingum River. There are about four covered bridges for you to see along the way. Only one of which still allows you to take your vehicle across. The route takes you through the river valley across pretty farm country, through dense woods and up and around tall river bluffs. The road is great for bikes! It twists and turns as it follows the river as well as climbs and dives through the hills and river bluffs of southern Ohio. Truly an outstanding Ohio motorcycle-road!!! Before you get started on this route, visit the Forest Service Office (614-373-9055) in Marietta and pick up a brochure that will highlight 10 points-of-interest you will find on the route. There are two small rustic national forest campgrounds along the route (at Hune Bridge and Haught Run Recreation area). The route begins in the historic town of Marietta Ohio. This town sits on the Ohio River and was a major port along the river when shipping along the river thrived. The town has multiple museums and a gallery for those of you who enjoy attractions like these. You can learn about this at the Ohio River Museum and learn about the town's history as an outpost at the Campus Martius Museum. At the end of the route you'll end up in Woodsfield (at state road 800 head north for about 3 miles) where you can grab a bite to eat at one of their restaurants. If you are in to hiking, you can access the North Country National Scenic Trail from this route. This national trail will one day connect the state of New York to North Dakota. A section of this National Trail travels from the town of Woodsfield to the Hune Bridge. on September 18, 2010 2 out of 2 members found this review useful. This route is a super day trip. We took a picnic lunch and found the perfect spot behind Hune Covered bridge. It was a shady picnic area not seen from the bridge. The 4 bridges are beautiful! We followed 26 all of the way to 800. Then headed toward 7 and followed the river back. on October 2, 2009 2 out of 2 members found this review useful. on January 28, 2011 1 out of 1 members found this review useful. I took this route twice last year, onece with my wife and another with a group of friends......A beautiful ride with a nice array of scenery. The covered bridges are a sight to see.....One, you do have to ride back a loose gravel road......Is worth the ride back as it is the best of them all.....Once you get to the woodsfield end, turn left and go thru Woodsfield and Straight to Malaga......There is a very nice sports bad with really good food right before the BP....It is called G-N Sports Bar & Grill, not open on Sundays!!!! on July 30, 2009 1 out of 1 members found this review useful. Great ride but don't expect any gas, stores, or taverns except at the ends. Best in mid to late October when the leaves change. on August 17, 2008 1 out of 1 members found this review useful. I have taken this ride many times, and it is always a lot of fun. The best 'roller coaster' is at the beginning of the road just outside Marietta. Be ready for it, and enjoy it, but ride at your skill level, the first few miles are a real challenge for any skill level. The bridges are a great reminder of a time gone by. Take a picnic lunch, and enjoy these bridges and the great road. on June 8, 2008 1 out of 1 members found this review useful. Traveled in June, Beautiful scenery. Nice curves and everyone on their porches waved. Loved the white, yellow, green, and orange house, too! on January 4, 2018 0 out of 0 members found this review useful. This is a truly great ride. Non-stop curves for 45 miles. I've been with friends who were glad to get to Woodsfield for a break.